Barcelona, May 30th 2018.- On the afternoon of April 23rd, Zero 2 Infinity (Z2I) performed another successful flight to Near Spacefrom Europe’s Stratoport. The aim of the launch was to test equipment for Europe’s leading aerospace company: Airbus. 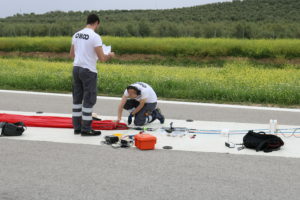 The Z2I and Airbus teams worked as one on the pre-flight preparations during the month of April. 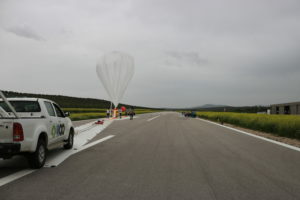 All the operations were performed from Europe’s Stratoport, also known as the Air Traffic Laboratory for Advanced unmanned Systems, or ATLAS, in Villacarrillo, Spain. This unique test flight center provides the right combination of field experts, dedicated infrastructure, clear airspace and excellent weather. From unmanned aerial vehicles to vehicles flying above controlled airflight, FADA-CATEC, who owns the Stratoport, is pushing the limits of what is possible, doing research and development now to enable the businesses of tomorrow. The flight was performed satisfactorily and both balloon and equipment were recovered immediately after it landed by the Z2I team. This is the second time Airbus, FADA-CATEC, and Z2I work together on a launch. 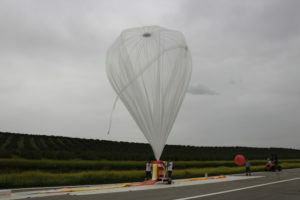 Z2I used a special balloon to reach a maximum altitude of 21,375 km, requiring a volume of 2100 m3 and carrying a total suspended weight of 95 kg.